The stunning sequel to Sarah J. Maas' New York Times bestselling A Court of Thorns and Roses and aNo.1 New York Times bestseller. I'm lost for words........ WOW, I thought book one could not be topped, well i was proved soooo wrong. Love can not express my feelings for this book, it was amazing, toe tingling, nail biting incredible. I'm just quickly writing this review before i start reading the book again. I think i read every page twice just to devour and to take it all in. every twist and turn was so unexpected. Sarah J Mass creates a world in her books that I never want to leave. I am in glass case of emotions! It took me 2 days to read this book as I could not for the life of me put this book down! 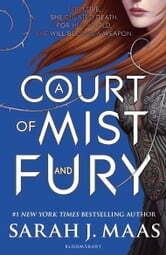 In my own little wee cucoon of bed and blankets then couch and blankets, I laughed, cried and cheered for the hero that is Feyre. I am sleep deprived yet I still cant stop thinking about this book. I don't want to write any more as I fear that I may reveal too much but Sarah J Mass I am officially a true fan. Why oh why do I have to wait another year for the final book! Loved these books! I literally never want to put them down and consequently end up sleep deprived!  Just read them again and enjoyed them just as much as the first time, can't wait for the third! Could not put it down i cant wait for the next book in may. I didnt see the end comming so many twists and turns.